Eco World Development Group Bhd plans to launch two residential and commercial property projects in Penang, with a gross development value (GDV) of RM1.26bil, in 2014 and 2015. Group president and chief executive officer Datuk Chang Khim Wah told StarBiz that the projects, EcoTerraces and EcoMeadows, would be launched on the island and Seberang Prai, respectively. The RM340mil EcoTerraces, comprising luxury landed homes, condominium units, and a private residents’ club, is sited on 5.26ha, about five minutes from Air Itam town in the northeast district. “We plan to preview the project in August 2014, which will attract a broad spectrum of buyers, as the location has easy access to the airport and George Town,” he said. On its other land-bank at Macalister Road and Anson Road junction on the island, Chang said the group did not have immediate plans to develop the site. “Due to its unrivalled location, we plan to use it as our Penang Show Gallery to introduce our brand and development philosophy of creating world-class eco living,” Chang said. 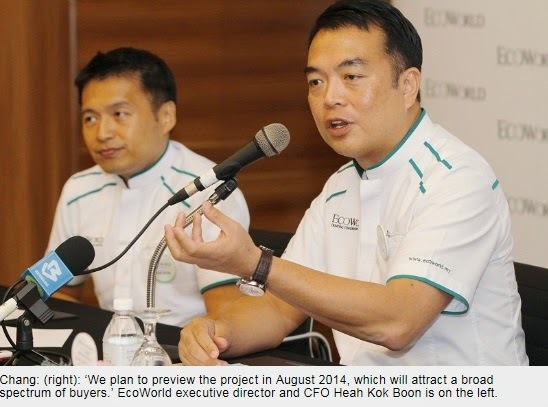 Next year, Eco World will launch the RM920mil mixed development EcoMeadows scheme on 24.28ha in Bukit Tambun. “Its freehold land status and location near the second link and adjacent to the North-South Highway gives it great potential to be developed as a mixed development project. “We will be introducing both landed and strata properties supported by a mini mall, comprising shops and offices all designed in line with our Eco theme which emphasises sustainability and livability,” Chang said. “Over time, we aim to build up our presence in Penang so that it will be able to consistently contribute around 10%-15% to total group’s sales. There will be terraces, superlinks, semi-detached units and condominiums for both of these projects,” he said, adding that the price of the properties would range from RM600,000 to RM3mil. .On Seberang Prai as an alternative development site, Chang said the fact that there were so many developers interested in Seberang Perai is proof that the area was rapidly turning into a growth location. “I am confident that if we concentrate on ensuring that our products stand the test of time, and we focus on delivering excellence, be it in service, product design or product quality, we will do well,” Chang added. Chang said while there had been some slowdown at the start of the year, as a result of the cooling measures by Bank Negara, they expected the property market to regain momentum towards the latter part of the year as all participants were adjusting to the new realities of the market. “The more challenging outlook has also caused developers to up their game and we expect new launches to showcase some good development concepts to attract buyers to continue to invest. With the completion and opening of the second Link, interest in mainland Penang has picked up significantly and we believe this will be the new hotspot for properties up north. “Overall, we remain positive about the Penang property market which is supported by solid fundamentals of strong underlying demand, good economic prospects and continued job creation both on the island and the mainland,” he added.